Are you a wine lover and you don't know what to do with your wine corks? Or do you simply like to do crafts? In any case, we bring you today very easy DIY cork craft ideas, so you can start giving a better use to them. Whether you are throwing a party, needing to display cards for your products, or simply want to have new ideas for any home celebration event, these place cards are very easy to make and add a cosy environment to your event. Keys are something we use every day, even if it's to go to work or go home. In accordance, keychains are an essential product. Why would you spend money on them if you can easily make them at home? Do you want to set up a romantic mood or merely decorate your home? 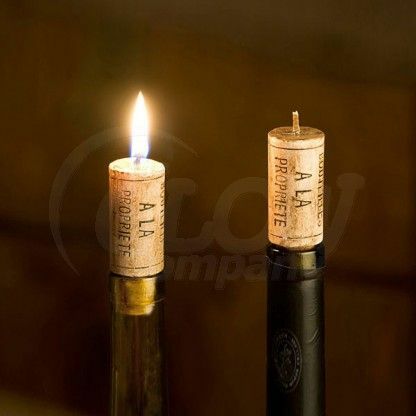 Collect you corks and turn them into candles. They look fantastic! This is an easy way to start personalizing your cutlery at home and impress your guests! Do you love writing? Are you sending postcards and letters to your loved ones, all the time? Why not customize them?! Make your own wine cork stamps, so you can have your personalized signature! You love plants but you have no garden at home? Start today making cork planters and, in a few days, you have your mini garden at home. Looks lovely! Your garden is growing and you are planting more vegetables and fruits than what you were counting on? Grab your wine corks and start labelling your garden! It's so easy and it looks much more organized. You have so many memories to share and you ran out of ideas to expose them? These wine cork photo clips will look fantastic on a rustic home environment! Do you love to sew on your spare time, or you just have to? Put more fun in it by making your own pincushions! They're so cute! These are perfect for someone who's always sharing their digital work. Get rid of those plastic USB drives and customize them!